This is an offshoot of a more general article on how to care for and restore gym equipment. On older weights you got at a garage sale, the paint might be flaking off, likely with rust growing underneath. If that’s the case, don’t try to just brush off the flaking areas. You’ll just get more flaking, and rust only gets worse if any is left. You don’t want rusty flakes of paint stabbing into your hands. 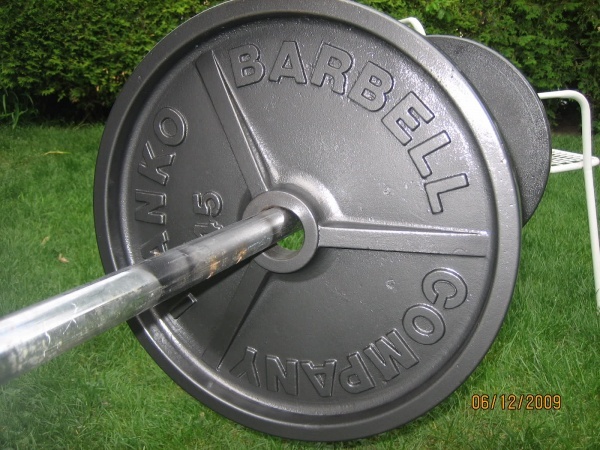 Classic old Ivanko or York plates, or other rare ones, can be worth restoring for the nostalgia appeal. Here’s how to fix your weights up and make them look like new. Nylon and brass are softer than iron, while steel is harder than iron. Well, it means you’re going to scratch up your plates by going straight to a stainless steel brush. A nice stiff-bristle nylon brush might get some rust off, and by the way you’ll want one of these to keep your olympic bar knurling clean anyway. 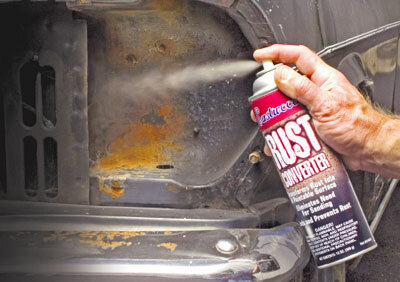 A brass brush will be more effective at scraping away rust. Either go to town on it with a brass hand brush or get a brass wire brush attachment for your high power drill. If all else fails, try a stainless steel brush (again, steel wire hand brush or steel wire drill mount). It’s going to scratch the iron, but if any brush will get the rust off, it will. You don’t have to actually brush off all that rust. You can spray on rust converter, a chemical that turns iron oxide (rust) into a stable compound that will inhibit rusting. Science! If you have flaking paint from severe rust underneath, you’ll need to brush the paint off first, using the brushing method as above. Repainting doesn’t work good if the paint underneath is no longer bonded to the iron. There are chemical products to convert the rust that you can get at Home Depot or Amazon. It might be called a rust converter, rust neutralizer, or rust reformer (the rust reformer is the most popular spray with our readers). Just follow the instructions on the spray can or the jug. Typically you’ll just spray it on, let it dry, and that’s it. It’s ready for painting. Some of them include primer in the mix, with the foresight that most people using it are intending to repaint the surface like we are. Non-toxic method: Anything with phosphoric acid will convert the rust. Coke/Pepsi has loads of it. Well, arguably all that sugar is toxic, but not for your hands or lungs. If you’re lacking ventilation, it’s an option. Before painting, be sure you have dealt with the rust first as instructed above. Put down some drop cloths or cardboard. You will make a mess. Do it in a well-ventilated area. If your rust removal chemical above doesn’t include primer, think about spraying on universal bonding primer before the paint itself. The manufacturer probably didn’t do it originally, but look where that got it. And they probably baked on the finish too for maximum hardening, which you might not do. Now, spray paint it! Do one side, wait a day, flip and do the other side. Go with a nice metallic color, anything that the can indicates is good for metal surfaces. When done well, you can get them looking like new! Weight plate manufacturers bake the finish on, rolling them through an oven on a conveyer. This hardens the paint to the iron, hardening it against abrasion and stopping the chemical process that creates toxic fumes. Once the paint is dry the fumes are minimal for a while, while baking completely wipes them out. But during the baking process you’ll have fumes blasting out of your oven. I don’t think this is a good idea unless you’ve got a spare oven somewhere like a garage that will never hold food again. Try out one of these methods, and post a link to your results in the comments below!